While each House of Hogwarts has their qualities, we can't help but feel that J.K. rolling could have given the students of Slytherin a little more credit. Yes, Malfoy probably moved on from the confines of the castle to major in pouting and plotting at some fancy schmancy wizarding university but that doesn't mean that all of an age-old house should be cast into the shadows. Tonk's mom was from Slytherin and she certainly raised a pretty awesome witch. Then there was Slughorn. He helped out in a big way when it came the Battle of Hogwarts. So yes, we understand the bad rap cast upon this house but why focus on the slippery underbelly and fangs of the snake when there are glittering scales and graceful movements to admire? 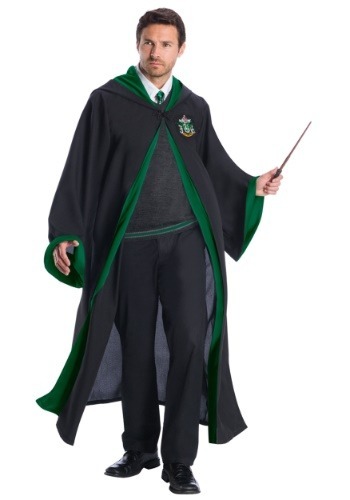 Whether you're dressing up as Malfoy, all grown up or you're going as Snape in his last few years as a student at Hogwarts, you'll enjoy casting spells in this green and black robe. The sleeves are belled for graceful wand movement and the open robes are fastened at the neck so they won't fall off as you run up the many flights of stairs in order to get to Divination on time. 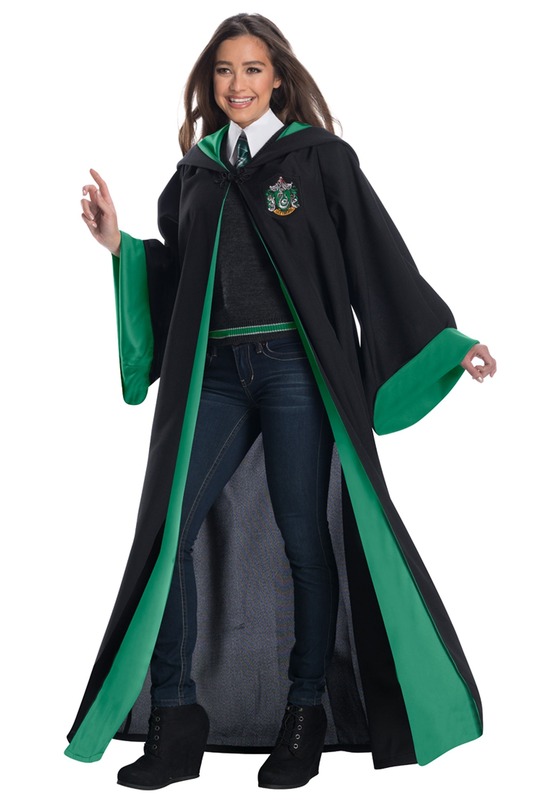 The robe is also fitted with an oversized hood so if you need to become the secretive student that people expect from Slytherin, you'll look the part. Whether you're planning on living up to Slytherin's cunning reputation or you'd like to clear their name with a diplomatic smile, you're sure to look the part in this long and flowing robe. Make Snape proud with a muddler and mint leaves by enacting some real-life potion making at a party. Pair up with some friends to extend a hand to the rest of the school. After all, it's time that people got over Slytherin's bad rap!